Though most of the collectives happened in the rooms, this is one of the collectives that happened in the lawns of IIMB. 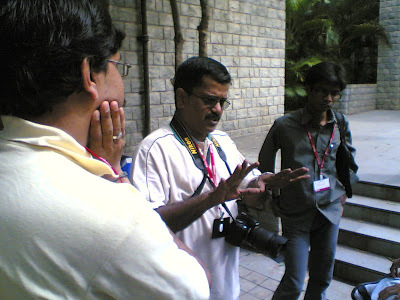 Sukumar from the Chennai Team, was giving his thoughts on photography, how to use the camera, and so on. The session was good. Guess, when this happened? This started immediately after the breakfast was over and before the actual sessions started. With Sukuamar are ramesh from chennai, myself, mahendran balan from chennai and others also.